Hokkaido is a very beautiful place in Japan. This place will always have a special place in our heart. We have our honeymoon in Hokkaido. Our first encounter with snow , it was said Hokkaido snow was the most beautiful as it was not polluted and fine like caster sugar. Imagine you have sugar rain on you. It just melt as you start touches it. How does it taste like ? Nothing! How do I know? Ya out of curiousity we taste it ! Well , you got to do silly thing here and there in life. At least we have lots of memory in our honeymoon. So when I come by this recipe with the word chiffon , it is hard not to draw my attention . The pink is so beautiful and it just so suit for a gal afternoon tea and brighten one day . 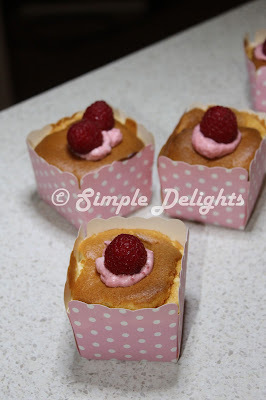 Instead of doing the -> Strawberry Hokkaido Chiffon Cupcakes. 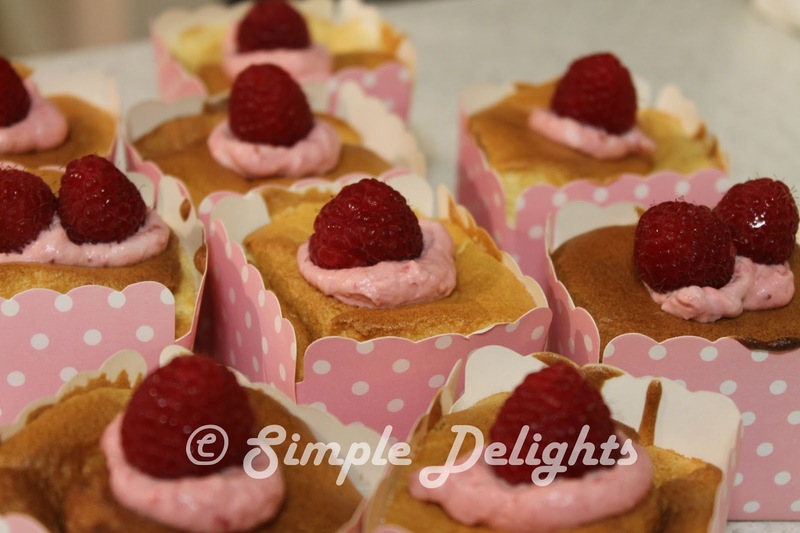 I change it to Raspberry Hokkaido Chiffon Cupcakes. The pink is more red on my version and of course this must go in a pink cupcake mold. 3.Whisk the egg yolk and sugar till pale with a hand whisk. 5.Sift in cake flour, combine well and put aside. 6.Beat egg white with hand held mixer till foamy and add in sugar gradually and continue to beat till soft peak. 7. Fold in egg white to egg yolk mixture in 3 portion . 11. Add in the raspberry puree and combine well. Chill the raspberry cream in fridge and used it when cupcake has cool down . 12. Once cupcake is done and cool down. Pipe the raspberry cream in and decorate with fresh raspberry . 13. Put in an air tight container and refrigerated before serve. I make this for myself. Love the color and the soft texture of the chiffon cupcake. I share this with one of my best family in Australia as an appreciation of their care and love for us all time. It was so so refreshing the cream and the cake is soft. Taste is super yum. My love one seeing this beautiful cake can not resist and have some too . Is hard not to share when he is your love one. And yes the cream is basically overflow and we think we stuff in too much for the first few. 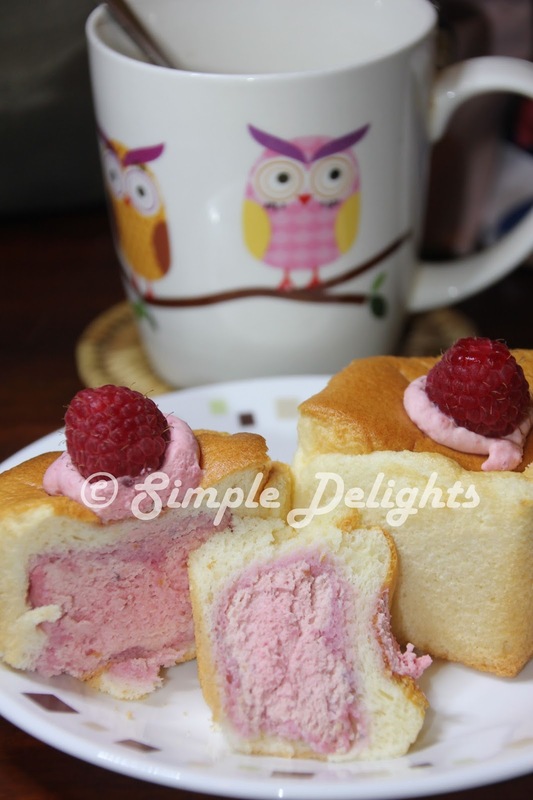 However it all goes well to our tummy :) Again another healthy cake , the size is small and it contain fruit ^^. Simple good dessert for a peaceful night. Try this , is simple and impressive. Honestly who will resist a beautiful cupcake .